Action Tree Service is continually committed to providing all phases of high quality, professional tree care at competitive prices. 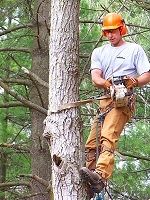 Whether it's the removal of a hazardous tree, trimming limbs, stump grinding, hauling debris and everything in between, we are well staffed and equipped to handle all of your needs. provided by an active owner who pays attention to detail. Get as many bids as you like!